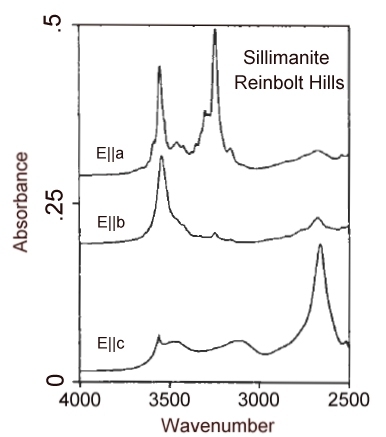 Polarized infrared spectra of a suite of sillimanite samples from high-grade regionally metamorphosed rocks and associated quartz veins and pegmatites (upper-amphibolite to pyroxene granulite facies), from xenoliths in basaltic rocks, and from alluvial deposits indicate that hydroxyl is the dominant hydrous species bound in sillimanite. Absorption bands at 3556, 3329, 3300, and 2348 cm-1 are characteristic of many of the samples. Heating experiments indicate that only above 700°C is weight loss proimarily due to loss of structurally bound OH. Complete dehydration required heating to 1400°C. The maximum content of bound OH in the sillimantes was 0.02 wt% H2O equivalent. The intensities of the OH features generally decrease with increasing temperatures estimated for metamorphism, consistent with the expectation that water activities decrease with increasing temperature. However, notable exceptions to this trend suggest that secondary hydration at the unit-cell scale is also a viable explanation for OH incorporation in sillimanite. Infrared spectrum in the OH region of a 1.0 mm thick crystal of sillimanite from the Reinbolt Hills, Anarctica.